Conflict of interest occurs when a public official, who has a vital duty to protect the public, misuses their power for their own gain. 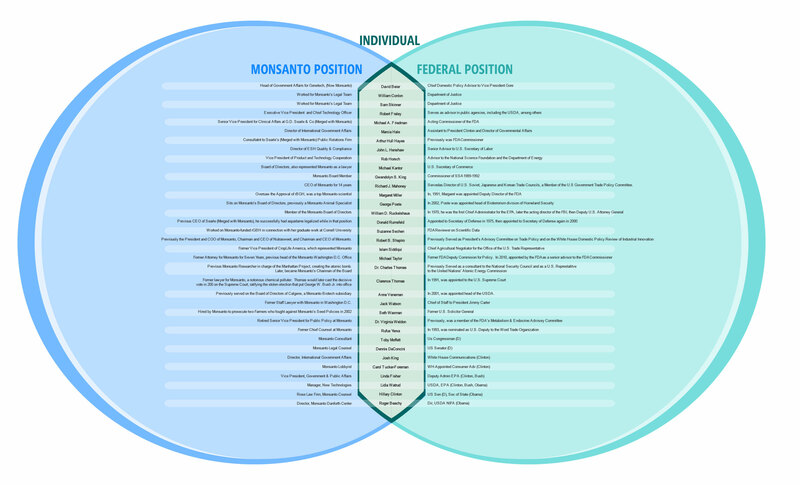 There are numerous public employees who have worked for or represented Monsanto and are now public servants in the United States government. This is a conflict of interest. Soy and corn products, which are in most processed foods and animal feeds, are full of Bt insecticide due to genetic engineering. The Environmental Protection Agency has recently raised the amount of glyphosate that is allowable in food. The amount permitted in soy has doubled from 20 parts per million to 40 parts per million. According to Dr. Mercola, other foods are now permitted to have even higher levels of glyphosate contamination-as much as 15 to 25 times earlier levels. There are about 1 billion pounds of insecticide used in America every year. This is staggering! Why is this happening? When you look at the chart below, you will see the conflict of interest among many public employees. This is amazing considering the fact that for even some minor transactions in life, people are asked a series of questions to see if there is a conflict of interest that might disqualify them from receiving a product or doing a service. No wonder our foods are full of insecticides and our environment contaminated by poisonous chemicals. *Click on the picture to make it larger.